Shipping $9.40 Add item to cart for shipping estimate. You can SAVE on shipping by buying multiple items from the same seller. Shipping is charged by each individual seller. Sellers at times may also provide FREE SHIPPING on select items or on entire order if it meets the minimum order value. Please check sellers page for more details. Option Small - 13" * 8" Medium - 15" * 10" Large - 12" * 18" Extra Large - 15" * 21"
You could easily keep several Dry Fruits and Sweets as well as chocolate in this Tray. Great as an unique traditional Indian housewarming gift. This Red Tray are made up of the best quality raw material and will definitely appeal you because of their elegance and durable finish. Shipping Cost $9.40 Buy multiple items online from Sangu Enterprise Ltd to SAVE on shipping. This item in Metal Handicraft category was first added to our catalog on 04-18-2017. 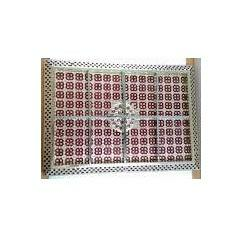 Buy Partitioned Traditional Design Red Flat Tray, sold & shipped by Sangu Enterprise Ltd where you can shop online for Indian Restaurant Supply, Pooja Mandir, Handicrafts, Utensils & Gifts. This Metal Handicraft collection has been tagged as traditional handcrafted Tray, Kitchen, home decor, utensil, serverware, decorative compartment thali.